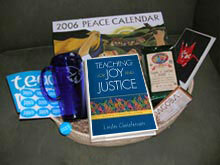 We’ve combined some of our union-made merchandise with Fair Trade organic items from around the world. 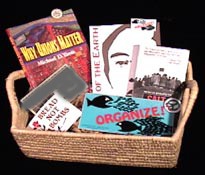 We will use an assortment of fair trade baskets this year depending on the items in the basket. 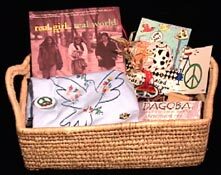 They are all sturdy and beautiful baskets, perfect for many uses. All are made in Bangladesh and are fair-trade certified from non-profit importer, SERRV. Be sure to check the rest of our Holiday Gift Items for more great gift ideas for any occasion! 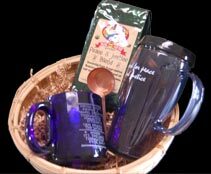 • "Peace and Justice Coffee", a Donnelly/Colt Progressive Resources Special Blend (Ahab's Revenge) , from small fair trade, organic coffee roaster, Dean’s Beans, 16 ounce package, whole beans - now in a compostible package! Ahab's Revenge was listed as The #1 Coffee Choice in Better Nutrition Magazine. They described it as "A knock-your-socks-off blend of potent robusta and smooth Arabica beans, with an enthusiastic caffeine content" Dean's Beans afficianado, Kate F. says: " ...as a new mom, it got me through many days after nights of little sleep. It was my lifeline!! And such a rich, full-bodied taste." • Hand-hammered copper coffee scoop made in Nepal by low-income women artisans of the Association for Craft Producers, a $10 value. 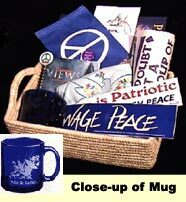 • A Cobalt Blue Glass Mug, an etched imprint on one side says "Peace and Justice" with a peace crane graphic. The other side carries a Margaret Mead quote - "Never doubt that a small group of thoughtful committed citizens can change the world, indeed it's the only thing that ever has." --"Humanity: A Celebration of Friendship, Family, Love & Laughter by Geoff Blackwell"
--"Great Peacemakers: True Stories From Around The World"
- - "Peace and Justice Coffee", a Donnelly/Colt Progressive Resources Special Blend, from Dean’s Beans, 16 ounce package, whole beans - now in a compostible package! Ahab's Revenge was listed as The #1 Coffee Choice in Better Nutrition Magazine. They described it as "A knock-your-socks-off blend of potent robusta and smooth Arabica beans, with an enthusiastic caffeine content" Dean's Beans afficianado, Kate F. says: " ...as a new mom, it got me through many days after nights of little sleep. It was my lifeline!! And such a rich, full-bodied taste." - - Organic Fair Trade Rooibos Tea. • An ivory-colored ceramic 13 oz. mug hat reads: "Encourage your hopes not your fears" on one side, and a line drawing of a bunch of small flowers on the opposite side. • The classic book "Labor's Untold Story"
• Postcard "Your Own Kind Words Embrace You Like Loving Arms." • Margaret Mead Poster – "Never doubt that a small group of thoughtful committed citizens can change the world, indeed it's the only thing that ever has." • Antenna Peace Flag (6" x 9" attached to a 5/8" diameter by 12" long wooden dowel. • DVD: "The Peace Patriots"
• Book: "Nonviolence Is Not For For Wimps - Musings of an Ohio Farmer"
• Bumpersticker: What have you done to make the world a better place? 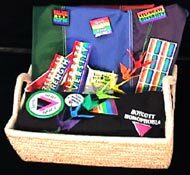 You pay $10 for the empty basket and before purchasing write a list of the items you would like in your gift basket in the "Comments" area of the shopping cart page. 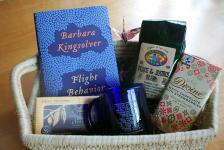 We will let you know the total of the gift basket before billing you. 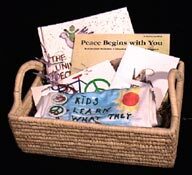 • Book: "Peace Begins With You"
• Button: "Free The Kids"
A War Economy Leaves All Children Behind"
• Button: "Please Don't Buy Me War Toys"
Poster: "It'll Be A Great Day When Our Day Care Centers Have All The Money They Need And The Navy Has To Hold A Bake Sale To Buy Battleships." -- T-PEACETREE: Woodcut of girl & boy watering tree, with wording "peace', "justice", "equality", etc. drawn by Erica Weil.